Choosing the right family safety app isn’t easy. We’d like to help you by comparing the features of the MamaBear app with a few other apps out there for Android and iPhone. In our last comparison, we looked at Life 360. Now let’s check out the similarities and differences of MamaBear to Apple’s iPhone app Find My Friends. Find My Friends is primarily a tracking app. With Find My Friends, users request connection to people they want to view location. Once a friend accepts the request and installs the app, a user can see their friend’s location and vice versa with the option to turn off location sharing. MamaBear and Find My Friends share a few similarities. There are also a few key differences. Who it’s targeting. MamaBear’s emphasis is on family safety, whereas Find My Friends is marketed in part as a social app for use by adults and their friends and companions. Location history. MamaBear offers a view of historical location points up to 7 days. Message feed. 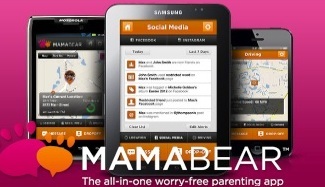 MamaBear presents all alerts and messages received for up to 7 days. Social media monitoring. MamaBear notifies parents when their child makes a new friend on Facebook, follows someone new on Instagram or uploads a photo, gets tagged or @mentioned, receives a message that includes inappropriate words, bullying language or any other restricted words the parent sets. Driving speed monitoring. MamaBear offers alerts when kids drive or ride over a preset speed limit including how fast and where. Optional location sharing. Find My Friends allows all user to turn off location sharing. Families using MamaBear can’t turn of child logged in location sharing from the app, though the parent’s location sharing is optional. Temporary sharing. 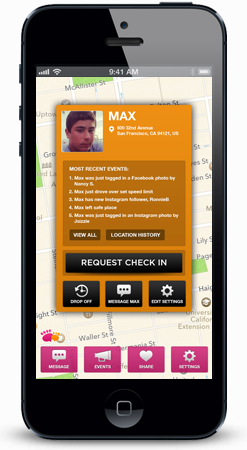 Find my friends offers a group of invited friends to share location for a pre-set timeframe. There are many great apps that offer a variety of fun and useful features! MamaBear strives to offer parents concerned about their children’s safety peace of mind and comfort. If you have ever shared your location on a mobile device, you may have used Google Latitude. Google Latitude allows users to find friends and family on a map as well as share where they are with friends and family. The user controls who gets to see their location and at what level of detail. If you used Google Latitude with your iPhone or Android device, the retirement means you’ll no longer be able to share your location using Latitude. Also, Latitude is no longer a feature on the latest version of Google Maps for mobile on Android and will be removed from iPhone on the App Store. That and your list of Latitude friends will be deleted. You can read more about the change and what it means here. With Google Latitude’s retirement, other location tracking apps will attempt to fill the void. While there are many choices for Latitude alternatives, for families there is no better replacement option than MamaBear. The MamaBear Family Safety App offers the best Google latitude alternative for Androids and iPhones. Adding MamaBear to your iPhone or Android device provides you a way track your children’s locations, making sure you are aware of where they are and where they’ve been. The app also allows you to schedule alerts for location activity and it gives your kids a one-click opportunity to check-in, or send you an emergency notification. This gives your children a sense of freedom while also easing your own worries and enabling you to keep the whole family safe and secure. In addition, you can selectively share your current location with your children. For concerned parents wanting to protect their growing children and give them the freedom they need to roam and explore, MamaBear goes a step further than Google Latitude. MamaBear doesn’t just tell you where your kids are on a map. The app alerts you if they leave school or a scheduled activity early or they visit a restricted place you set. MamaBear monitors your kids’ social media behavior with notifications about new friends or followers, photo uploads, tagged photos or posts and restricted words you deem as signs of bullying or inappropriate on Facebook and Instagram. MamaBear can even let you know if they are in a speeding vehicle. Without Google Latitude, parents still have options for sharing their location and tracking their children. MamaBear is one GPS tracking system for mobile devices that offers the same features at Latitude, along with so much more. MamaBear is available for download on Android devices here and Apple devices here. The following video is a MamaBear app demo from CFN13 news in Orlando, Florida. 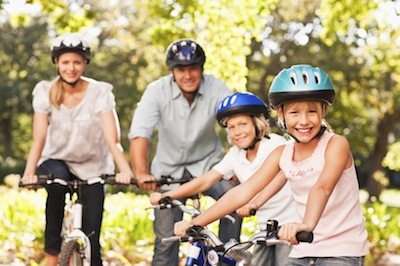 Many parents wonder if they should adopt a family safety GPS tracker app or service. There are many benefits to using a Family Safety GPS Tracker like MamaBear, but we know parents can always use a little more justification. Visit our blog to discover the top five reasons why our customers use a family GPS tracker like MamaBear, in addition to a few tips on what separates the better family GPS tracker apps here.